Below are the amazing applications that were selected for our ChooseWhat #AppOfTheWeek list. Each application provides a unique set of features, but they have all been chosen for their value to entrepreneurs. Utilizing the apps below will save you time and make you more effective. Follow @ChooseWhat to stay up to date on the best tools for your business. Trello : Free project management app/ website. Very straightforward and easy to learn. RememberTheMilk: Great To-Do manager with really functional app and website. Does require a small annual fee to sync mobile apps. LastPass: Password manager with extremely broad smartphone and browser integrations. Udemy: Market for online classes with a large community that does a great job of rating the courses. Retail prices for the classes are high, but they frequently run specials that dramatically reduce the cost. Mention: Tool to track keywords and brands when they are “mentioned” online. Great way to find social media conversations related to your company or industry that are happening right now. CNet: Tech news app is extremely informative and current, but also very fun. Great way to stay up-to-date on the technology industry. 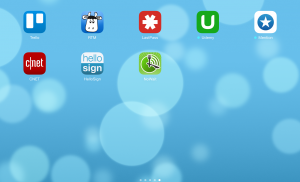 HelloSign: This is by far the easiest way to esign a document for free with your smartphone. No pen; no printer; no paper; no scanner. NoWaitApp: For restauranteurs, this is a great way to encourage/ manage “walk-ins.” For the rest of us, it’s an awesome way to ease the stress of eating at a place where you can’t make reservations.